How do you inform people about their surroundings in large buildings? These custom printed wayfinding and office signs are excellent for pointing employees and visitors in the right direction. 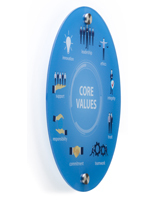 Whether you're introducing your company to passersby, designating the floor you're on, or showing where the conference room is, this interior signage makes it clear. The custom printed wayfinding and office signs come with our UB digital printing services for creating fully personalized graphics. 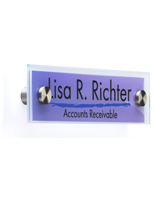 Feature the company's logo, employees' names, and inviting designs of your choice. Best of all, these custom printed wayfinding and office signs come with bulk pricing to accommodate large orders for expansive locations. 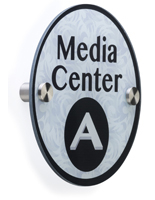 The custom printed wayfinding and office signs are made with acrylic plaques and metal standoffs. Each graphic display literally "stands out" from the wall for a more dramatic presentation. This gives them a sleek appearance that will complement any professional environment. Our wayfinding and office signs are imprinted in full color using UV digital printing, a high-quality process that creates vivid imagery. We use second surface printing, applying the graphics on the back of a clear acrylic panel. This ensures images won't get scratched off the front. 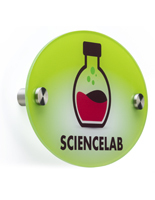 Wayfinding and office signs are available in many sizes to fit any business's needs. Representing your company in a large building's hallway? Use a bigger display, like a 11" x 17" to attract greater attention to your brand. Noting each of your employees' work areas? Feature smaller graphics holders so the walls aren't too cluttered with signage. 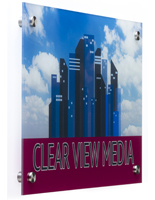 With our office signs, businesses can freely personalize their graphics to their preference. 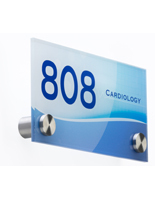 We print this interior directional signage in full color to recreate any company's branding. 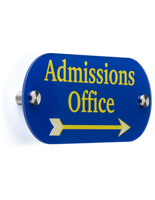 At Displays2go, our in-house office signs are similar to our logo with dark blue text with a white wall background. 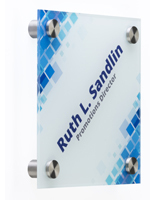 Use your preferred font and branding to make these displays specific to your organization. Remember to prioritize readability so passersby won't get confused. Sizing – Keep the most important information, like the room name, the largest object in the design. There's no reason for the logo to outshine the destination. Simplicity – This enhances readability by keeping the text uncluttered. Use a logo or a representative symbol for the room, but don't over-do it. Need solution with replaceable messaging? 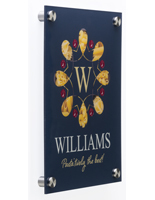 These pre-printed displays are an extension of our DSIGN line of acrylic signage kits that allow the customer to print their own designs on film sheets. These wayfinding signs are ideal for directing people, from marking the floors in a skyscraper to simply labeling where the break room is. Design your own solution with our easy to understand templates. Get wholesale pricing and supply your whole building when you order on Displays2go.com.